The $24.95 MSRP will make the Universal Car Remote more affordable than ever for car owners who are looking for a high-quality alternative to automotive dealerships. It will also position Universal Car Remote for expansion into mass merchant and convenience store / fuel station channels. Universal Car Remote will be making its CES debut, Jan 6-9, 2016 in booth #4130 at Las Vegas Convention Center. "Since launching the Universal Car Remote, we’ve realized manufacturing efficiencies and increased volumes that enable us to be much more aggressive on price," said Mark Lanwehr, owner and president of Solid Keys USA, "Together our Universal Car Remotes, Universal Car Keys, and our expanding line of complementary keys and replacement shells are becoming a huge success for retailers." Before the Universal Car Remote, automotive dealerships had a genuine monopoly on replacing remotes. The Universal Car Remote changes all that, allowing consumers the opportunity to pick up a replacement at a local store--avoiding the time, expense, and hassle of a dealership appointment. The product’s universal capabilities, simple setup, and low price make it ideal for retailers. It’s perfect for big-box stores, auto parts stores, hardware stores, home improvement stores, locksmiths, car dealers, fast oil change shops, independent garages—and now, mass merchants and convenience stores. Before the Universal Car Remote, it was impractical for retailers to sell replacement remotes due to their high cost and wide variety. Now, major retailers and small shops alike can easily enter into the profitable automotive remote replacement industry by selling a single, easy to use, low-cost device. 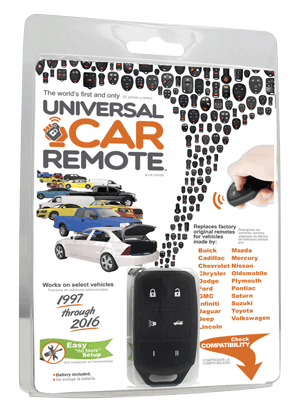 About Universal Car Remote Universal Car Remote is part of the products line of Solid Keys USA and iKeyless LLC, a privately-owned technology company based in Louisville, KY USA. iKeyless specializes in the design, manufacture, wholesale distribution, and retail sale of replacement automotive keys and keyless entry remotes. Solid Keys USA: a division of iKeyless, LLC.